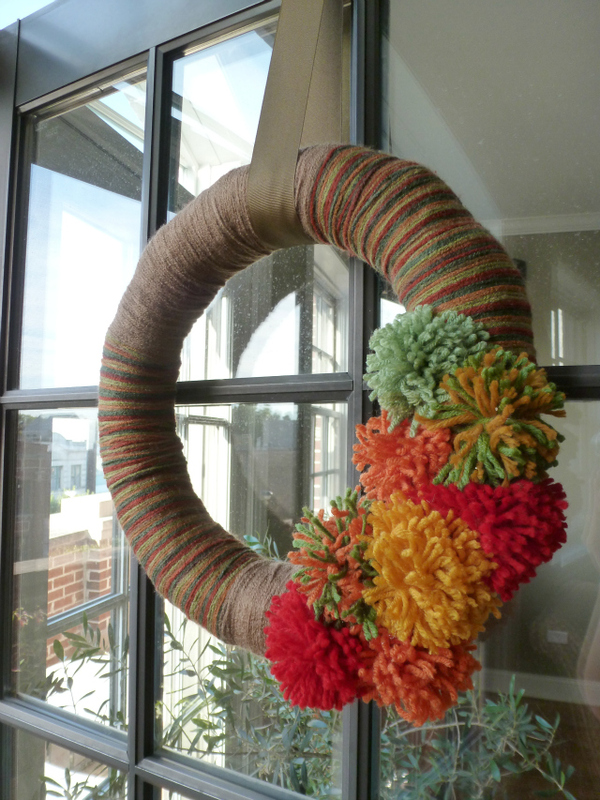 Introducing my new fall pom-pom yarn wreath – the result of the September Design Improvised DIY Night. 1) Choose your color palette – the key to making it look good is finding a fun combination of colors. 2) Keep the plastic wrapping on the wreath form to hold the straw in place (you don’t want any poking out through the yarn). Affix a piece of yarn with a dab of hot glue on the back of the form. I also put a piece of tape on top of the glue just in case. 3) Start wrapping…and wrapping…and wrapping! Try to line up the yarn as close as possible so there are no gaps where the wreath form shows through (but don’t worry about the back of the wreath being messy). If you are colorblocking, determine when you want to start the next color (you can eyeball it or mark it out on the wreath form before you start). Cut off the yarn and secure with more glue on the back of the form. Add the new yarn with another dab of glue and start wrapping. 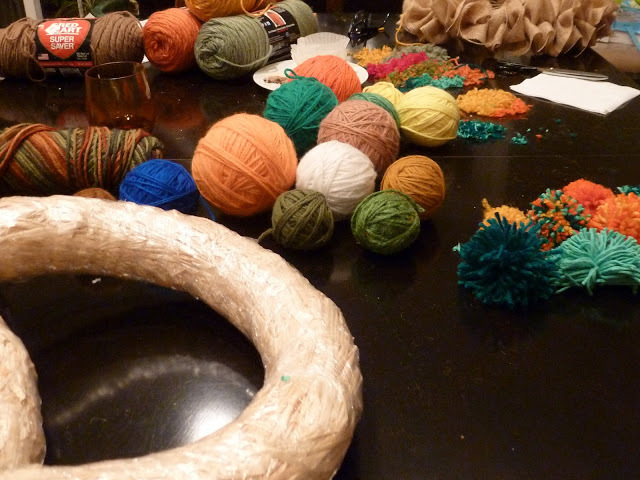 4) Make your pom-poms. We followed this tutorial. You might need to make a couple practice ones before you get the hang of it. 5) Play around with the positioning of the pom-poms and the mix of colors you want use. 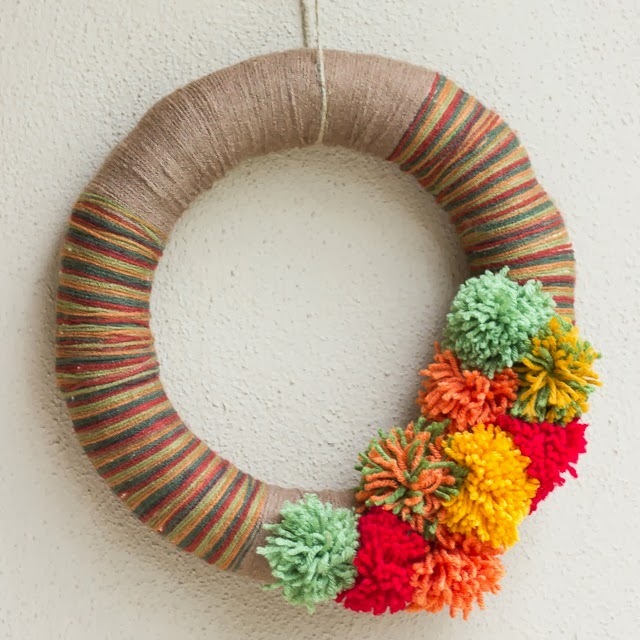 6) Once you have it arranged how you like, affix the pom-poms to the wreath with hot glue. Finally, hang up with a ribbon and make yourself a cup of hot apple cider (or some other fall treat!) to celebrate. Looks great Haeley, especially in person!!! I love this!!! So cute. How awesome that you are making this. I follow you in twitter andover your tweets. Thx dear!